Probably a first… 6 Koreans are in Europa League play tomorrow (Thursday), and there’s a brief kickaround later on in the post about what’s been circulating on social media waves this past week. Park Jooho’s really not near the picture of late but you never know if he’ll figure on the bench because of rotation. Suk Hyunjun didn’t play in the 2-1 win over Benfica on the weekend so maybe he’ll start or at the very least get a meaningful shift in. Spurs have got a really congested schedule ahead (4 games in 11 days) including two Europa League ties and an FA Cup match on the weekend. There’s certainly a start at least in one of those games and you wonder if the first choice squad (which Son isn’t really part of right now) might be rested for FA Cup against Palace. We’ll see how things shake out. The trio of Koreans in Augsburg welcome Klopp’s Liverpool. Haven’t watched Augsburg in a while but what I can gather from Twitter-surfing is there’s just as good of a chance that all three will start as there is that all three won’t. Hong picked up a knock on the weekend, which probably doesn’t tip the odds in his favor for starting. Media is reporting two possible June friendlies against the Czech Republic and Spain ahead of those two nations’ Euro 2016 tournament. Although the matches will be played abroad in Europe (thus not bringing in revenue in South Korea, which is disappointing), it’s still refreshing to see us play stiffer opposition than our usual African or mediocre European team. Will be an interesting test. FC Seoul will be opening a team store in front of Sangam Stadium this season. Very few teams have a team store at all so it becomes annoying to purchase team merchandise at the stadium, and it gives off more of an official feel than the odd temporary stand, which I understand is quite the norm across the league. Jeju still gets top prize though,.. 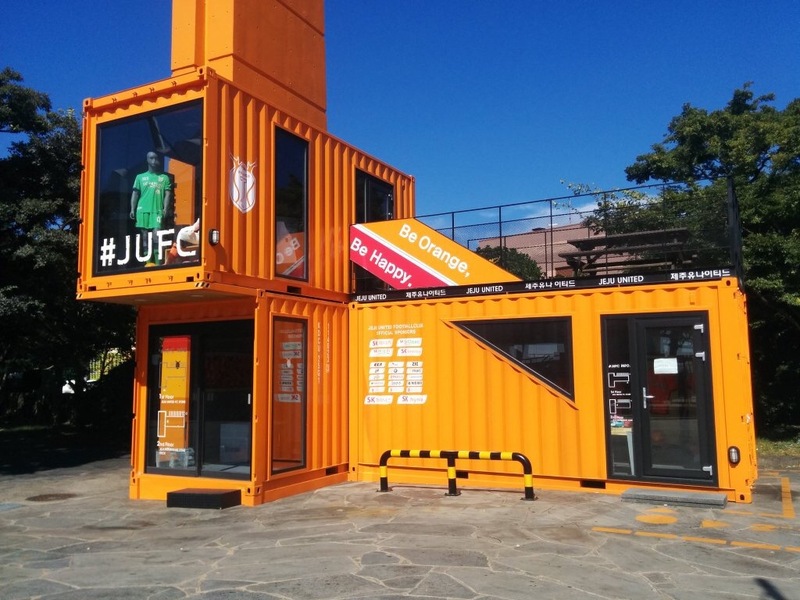 They built a team store out of SHIPPING CONTAINERS. How Jeju. One final note – Tim Cahill, who left Shanghai Shenhua this past week after being informed that he was not in the new manager’s team plans – which is absolutely baffling, by the way – has an agent that’s looking into possible destinations in South Korea. However, I doubt any team has the financial flexibility this late in the window to cough up the million or so needed to bring the Australian international to South Korea…He’ll probably end up somewhere else in China.